Audi's Quattro is an iconic model in its own right, with a league of fans still drooling over its revolutionary four-wheel-drive system 35 years after its release. And with the name Nigel Mansell amongst its previous owners, an example that came up at Silverstone's recent Classic auction was extra sought-after, eventually selling for £26,438. The 1984 model was registered new to Mansell on June 13 that same year, before being UK road registered on February 4 1985. At the time the British racer was driving for Team Lotus and living on the Isle of Man – an island itself well known for motor racing heritage. The future Formula One and Indycar World Series Champion is believed to have sold the Coupé following his move to Williams Grand Prix in 1985. Since the model left Mansell's gifted hands it had four further owners, covering a total of 116,000 miles in its lifetime. However, in April 1995 it was subject to an insurance total loss payment due to 'theft of parts from the vehicle'. The parts in question are unknown, but they didn't include the original factory-fitted engine block, which remains in the four-seater. The car also features revised 20mm lowered suspension and wider eight-inch wheels – both of which had been introduced on the Quattro that year. 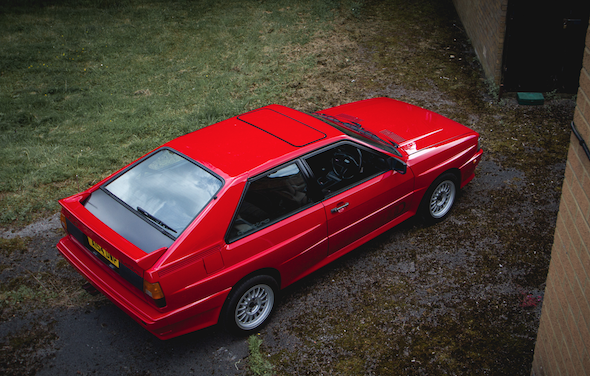 After spending eight years off the road, the Quattro underwent an extensive restoration in late 2011, early 2012. The last registered keeper owned a manufacturer-approved bodyshop and carried out much of the restoration himself, fabricating several repair pieces as well as sourcing two new front wings. The 2,144cc five-cylinder powerplant underwent a thorough overhaul, while the suspension and running gear were also rejuvenated. Luckily, the interior did not need much work, other than a good clean, and thanks to the hard work and perseverance of its last owner, the model was sold in a remarkably good condition.